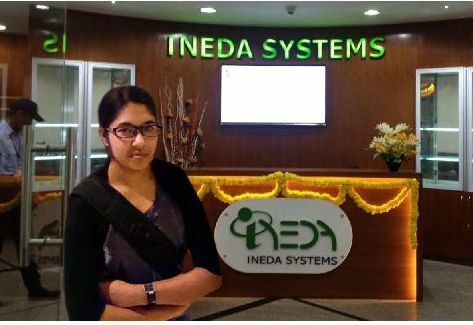 About the Author: Aarati Mehta from BITS Pilani shares how her internship at INEDA Systems where she worked on Internet of Things (IoT) allowed her a peek into the future of mankind. “The Wearables and IoT set to change the way we live and work”. The news headlines a few days ago. I began thinking about how many things in today’s world could operate with the click of a button, and I began what seemed like endless count. Right from making coffee, air conditioners, or locking the door to accessing 4000 exabytes of data (which is roughly equivalent to a stack of books from earth to Pluto and back 80 times! ), all of this can be done simply with the click of a button; mostly from the one or more hand-held device – like your smart phone or tablet, at any time and at any place. The world has never been the same with the advent of the internet and now the IoT is revolutionizing the way we live at a rapid rate. And like most teenagers, I sometimes used to ponder over how such mammoth tasks could be performed at one click from the same device, until I interned at INEDA Systems. INEDA Systems is a company which is building a leading edge platform for IoT and Wearables electronics. This summer, it became my gateway to IoT and wearables universe by providing me an opportunity to become a part of the team. Throughout the ride to work, several thoughts came up in my head regarding what sort of work I would have to do and whether I would really be able to do it or not. Seeing a 19 year old girl coming in was indeed a subject of awe and would definitely raise the question of how she would collaborate with colleagues who were several years older and more experienced than her. I could gather very little from my very first meeting with the senior manager on that day. I could only make out that I had to work on automating something which required me to code in a scripting language I did not have any prior knowledge of – Perl, which I was expected to learn within 2-3 days. It sounded like an arduous task but I recollected what my dad had told me just that morning about getting a job done and trying to go beyond expectations. In those initial few days, I was so engrossed in learning Perl from several sources that it almost felt as if I was having a discussion with Larry Wall over tea! With each passing day came newer challenges. I was asked to develop codes to locate files, locate certain prints in the file, and redirect files. Along with this, I was asked to learn about software development cycle, microprocessors, and a software called Jenkins. By the end of two weeks of questioning, reading, exploring, and coding, I could finally see the big picture and understood my role there. The company was developing a software development kit (SDK) which could be used by their customers in their smart devices like a smart watch, which by the way was the device which I was testing software for. Each day, I was running a manual test for a different sample app developed, such as the heart rate monitor or VAD and then coming up with a code to automate the test. However, that was not the end of the story. Over the next two weeks, my mentor decided to challenge me further. He asked me to integrate all my previous codes written for testing the functioning of each sample app and further develop codes that would automatically go through a sanity check of the software on a daily basis, create an excel sheet and update it based on whether a particular application was functioning or not, and send a report along with an attachment of the sheet in the form of an email – all of this with the click of a button! There were days when I would spend 4 hours trying to debug the code I had written, and days when all I could see on the terminal screen was the word “Failed”. Nevertheless, I continued to persevere and left no stone unturned. My mentor was quite encouraging and utmost patient with me which I am very appreciative of. Many times, I’d get tired of looking at the word “Failed” and sometimes thought that fixing the code was impossible, but my surroundings taught me that you must train your brain to keep coming up with different solutions to a problem by studying, discussing, questioning, etc. By the end of the month, I developed skills like logical thinking, coding, and even life skills like perseverance and patience. I also feel I have had a peek through the door of tomorrow by learning about IoT and its applications. Connecting 6 billion devices, employing people in over 350 companies, and performing tasks like detecting sleep patterns, monitoring pollution levels, saving electricity, and even testing for diabetes and heart failure; we can see that we are at the early stages in the creation of an IoT world and this is just a glimpse into what is possible when you combine sensors, actuators, and networking intelligences. Gradually, I see the vision of our honorable prime minister about constructing smart cities come to life and through my internship, have also been a tiny tiny part of it. Done a great job Aarthi, Hope you get the best!! Great article,thanks for sharing post .